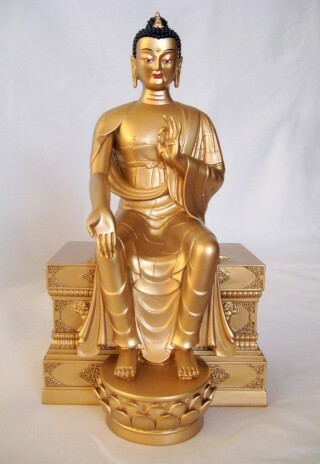 Statue of the future Buddha, Maitreya. Photo courtesy of the Maitreya Project. Objects become “holy” when they contain the presence of a buddha’s holy body, holy speech or holy mind. There are several ways in which to engage with holy objects. You can make offerings, prostrations and circumambulate the holy objects that already exist, you can create holy objects that become future sources of blessings and pilgrimage to others, and you can also help sponsor a holy object initiative with volunteer time, money or prayers. Holy objects can even be used to benefit animals! Although animals may have a difficult time with making offerings, you can always help them to circumambulate; give them a nice gentle bonk on the head with your stupas, statues and tsa-tsas; or recite mantras for them.